Learn to play Butch Baldassari’s renditions of fifteen stirring and uplifting traditional hymns by following along with the music and tablature. The CD features Butch Baldassari on mandolin, mandola and octave mandolin, accompanied by some of the luminaries of the Nashville bluegrass scene. Fiddlers Stuart Duncan, Aubry Haynie and Andrea Zonn, guitarist Robert Bowlin, bassists Dennis Crouch and Mike Bub, and concertina player John Mock contribute gorgeous back-up harmonies and solos to each tune. 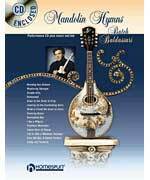 The book provides the music and tab for the mandolin solos for each song. Songs: Morning Has Broken; Wayfaring Stranger; Simple Gifts; Redeemed; Down to the River to Pray; Leaning on the Everlasting Arms; What a Friend We Have in Jesus; Amazing Grace; Unclouded Day; I Am a Pilgrim; Softly and Tenderly; Precious Memories; Sweet Hour of Prayer; Life is Like a Mountain Railway and Pass Me Not, O Gentle Saviour.